Streamed, recorded and uploaded every week. Subscribe for our weekly adventures and join us live on Fridays at 10pm Eastern/7pm Pacific! Apologies for the technical hiccups in the video. 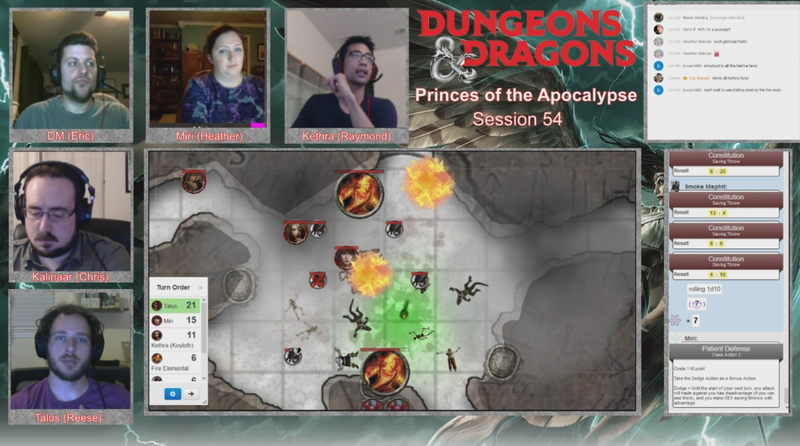 We live streamed this session for the first time in a year and I clearly still have some settings to tweak. Work in progress! In coming down to our final of four elemental-themed dungeons, I really wanted to crank up the tension. The story and plot derail a bit at the end of “Princes of the Apocalypse”, boiling down to a series of Zelda-like dungeons complete with boss fights and magic items that defeat them. I had each dungeon tell more of a story to make them more engaging, even as my players stomp their way through them with barely a sweat. 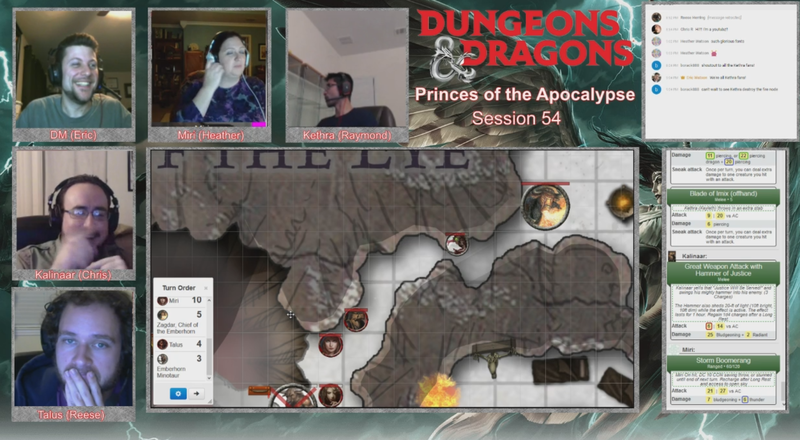 The aboleth guarding the water node, the complete collapse of the earth dungeon, and Miri briefly turning on the party to act as a temporary air prophet in the Howling Caves. It was the latter that gave me the idea to properly introduce Vannifer, the tiefling prophet of fire. Turning a previously rewarded magic item or trinket into a plot-item is a neat tool for a DM to employ. It was practically built-in already with the elemental weapons, so I had Kethra’s Blade of Imix act as a conduit for Vannifer to contact them. I’ve dropped the ball when it comes to building proper antagonists for the party. Having four main villains instead of a central one proved problematic. It’s difficult to build up a villain without using just straight-up cutscenes, or smacking around the players in a fight they’re not supposed to win. Neither are ideal but I employ the former sparingly. After the escaped the mega-dungeon for a long rest, Vannifer appeared and taunted them, revealing that by closing the other elemental nodes they’ve only made fire stronger. She’s been able to spy on them through Kethra’s blade that was given to her by her former mentor-turned-fire-cultist. I didn’t just taunt them, I wanted to actually reflect the fire cult’s growing power in the late hour. As Vannifer’s ritual draws near, the Fane of the Eye is literally burning, with smoking billowing up out of the Fire node, and smoke mephits and fire elementals wrecking havoc. That fight ended up taking longer than I anticipated. Fire Elementals are surprisingly painful with their Fire Form ability constantly burning the party – even when half of them have fire resistance. Kalinaar fearing one of them through Menacing Strike created an awkward situation where the Fire Elemental was faster than him as it chased after Kethra instead. Eventually the fire fiends went down but the party had to immediately Short Rest, as Miri took a large chunk of damage in the battle. It’s a bit of a stretch to Short Rest so soon after Long Resting, but the party did make their way all the way out of the dungeons into the Sighing Valley before returning back down to the Fane. I don’t even bother switching maps to the Temple of Air anymore – just handwave all that movement! They traveled deeper in the Fane, heading straight Northwest toward the fiery minotaur guards. They’d previously fought and killed a couple of minotaurs after defeating Aerisi, so I had a different plan for reinforcements. I had two Eternal Flame Guardians and a Priest heading down the magical elevator that connects the Fire Temple, the Fane of the Eye, and the Fire node dungeon. If there’s one thing I’ve learned as a DM, it’s that if there’s any kind of pit in your battlemap, expect your players to want to shove and knock their foes into it. Hilariously enough they were completely unsuccessful at knocking the minotaur guard backwards into the volcano entrance of the natural elevator shaft, despite all getting a round before my abysmal Initiative roll. Kalinaar and Kethra both attempted to shove while Miri tried to use her new Thunderwave ability. I attempted to Charge and Gore with the minotaur only to miss and get completely demolished in the next round. The minotaur chief Zegdar didn’t fare much better against a Hasted Kalinaar, even when Talus shut down the Haste for another Bigby’s Hand. The party’s handling of the elevator reinforcements was appropriate and hilarious. Kethra used her new Suggestion spell (did I mention they hit level 11 at the beginning of this session?) to convince one of the guards that the other two were duplicitous enemies of the fire cult, and to shove them into the fiery pit! He successfully shoved the other guard while the priest STR checked him. Talus then used Bigby’s Hand to first knock the priest off, then the guard in the following round. Beautiful. Previous Previous post: D&D Live Stream Tonight!